“John Pilger, my name is Fariha Karim. I think you know my uncle,” my 21 year old niece had blurted out. She was a big fan of the celebrated investigative journalist and had clambered through throngs of people in Trafalgar Square, up the large stone steps leading to the iconic lion statues and climbed her way over the lions, past the organisers to get to the tall Australian. Most nieces tend to think their uncles are famous. Fariha had seen me on the podium when I’d chaired World Press Photo. She’d been to the award ceremony when I was given the honorary fellowship of the Royal Photographic Society. 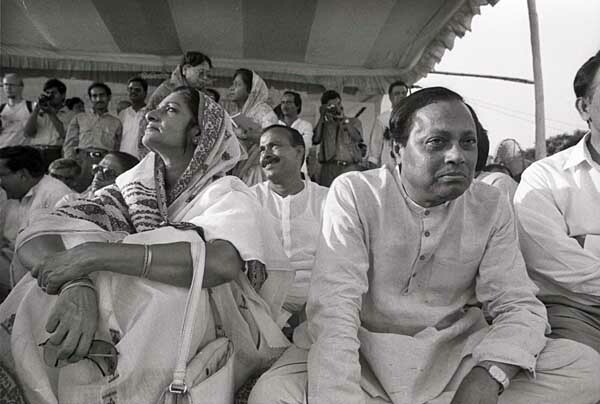 She’d seen me preside at Chobi Mela. Pictures on the occasional book, the odd Time magazine cover and a few exhibitions had reinforced my image in her eyes. That was enough for my youngest niece to think everyone in the world would know her uncle. Fariha was thinking of entering journalism. So when she saw this famous journalist at an anti-war demonstration in London in November 2001, protesting against the British-US bombing of Afghanistan, she decided to take full advantage of the situation. As most of Stop the War marches were in those days, it was busy, with numbers of protestors regularly running into tens of thousands. Organisers estimated 100,000 protestors; police shrunk numbers to a conservative 15,000. Speakers included veteran Labour MP Tony Benn, Bianca Jagger, then Labour MP George Galloway. John Pilger was amongst the celebrities. It was a brave attempt by the aspiring journalist, but her uncle failed to make an impression on the big man, and Fariha hastily retreated. I suppose in photojournalism circles a few people would know me, but it is rare for a majority world professional to be known in the west. A famous western journalist was a different matter. Pilger was known worldwide. His book Hidden Agenda, was widely read. His films had won awards. His words mattered. endeavour to respond to your email as quickly as possible. be possible to reply personally to your mail. I have admired your work for many years and use a lot of it when teaching at Pathshala, our small school of photography in Bangladesh. The lead statement in your blog, quoted above, is one that I ardently believe in. I was therefore surprised when Hasna Moudud forwarded me the article “The Prisoner of Dhaka” this morning. I can understand Hasna’s reasons for sending me the article. It is her husband in jail and her attempts to circulate an article which paints Moudud in a good light, may not be journalistically valid but an understandable response from a spouse. However for a journalist who is acclaimed for his investigative prowess, to have so many significant omissions, and a fair number of inaccurate observations, is worrying for the profession. The arrest of Moudud on the basis of alcohol being found in his house is laughable, and clearly a setup. We have written about it in national Bangla newspapers. The actions of the military government cannot be justified, and we have vehemently protested through our blogs and in local newspaper columns. Unfortunately our words do not reach mainstream media in the west. Yours does. Hence it is important that you voice your opinion against such irregularities, as you have indeed done in this article. But to paint Moudud as a saint, does go against the sentence at the top of this mail. A google search on Moudud Ahmed and chameleon will provide enough links to whet any researcher’s appetite. Sure, not all those links can be trusted and as a journalist you need to dig deeper to get to the facts, but that precisely is what has been carefully omitted in the Guardian article. I have watched this man wax lyrical about any leader he currently served, only to rapidly change colour and join the winning side when the tables were turned. Moudud and his group of lawyers have abused the legal system wherever possible and under each regime, but for me, one of his ‘lesser’ crimes is perhaps the most blatant. Demanding the clemency of a murderer, because he was a political thug loyal to the party. I do not want to list the misdeeds of Moudud. You are a trained investigative journalist and there is enough evidence out there for you to make your own opinion. Neither do I support the arrest of Moudud on the charges made against him. There are far more sinister charges against the man and it is somewhat pathetic that the government had to resort to this charade to jail him. But to paint one of the most despised men in Bangladeshi politics as a hero, does insult the Bangladeshi public. While I dislike Moudud for his blatant opportunism, I will defend his rights in this particular arrest. That is because even a lying, conniving opportunist politician deserves what is due in the law. Not because he is a hero. To paint him as such is simply shoddy journalism. I have tried contacting you in the past, to congratulate you on the excellent journalism that you have consistently been responsible for. Indeed you have been a major inspiration. An article such as this casts doubts on your journalistic rigour and your judgement. I’ve gotten used to this lack of response. On the rare occasions when I’m asked to submit a piece for some prestigious western publication, if I write a piece that is critical of western journalistic practice, the communication goes blank. They are busy people, and polite rejections are perhaps an expensive option. We however lay great store to these shining examples of free media. “It’s been reported on the BBC” gives a statement a holy aura. The Guardian too is amongst the exalted ones, with Pilger the high priest. It would be so nice though if the heavens were to write back.